One of the more curious drivetrains to be be introduced in recent years came from Ford in 2014. The 1.0 Ecoboost three cylinder engine has won International engine of the year for the last three years. The engine makes 123 horsepower and was only paired with a 5 speed manual gear box in the Fiesta. Most engine swaps found on DT are of the V8 variety, but this car presents an interesting opportunity for chump change. 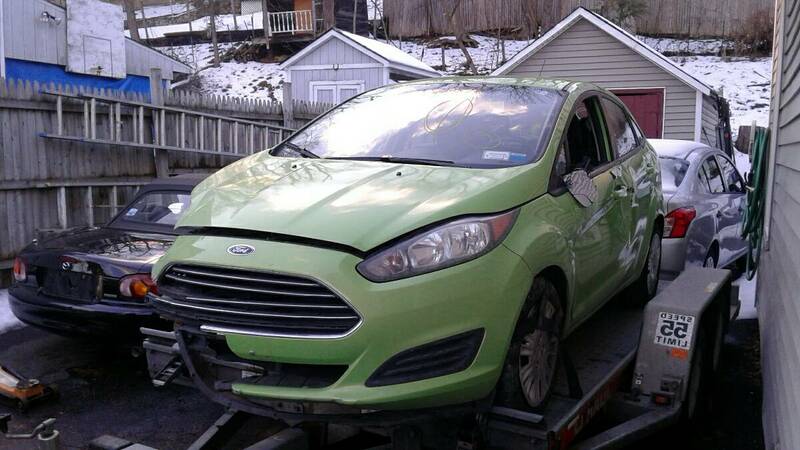 Find this 2014 Ford Fiesta 1.0 ecoboost salvage car for sale in Walden, NY for $600 via craigslist. The seller bought the car sight unseen from a Co-part dealer with the intention of making the repairs needed to make a daily driver. The car was a bit worse condition than anticipated so the seller has decided to take a loss and move on. The is not running currently due to a hole in the oil pan. There are only 20,000 miles on the car. 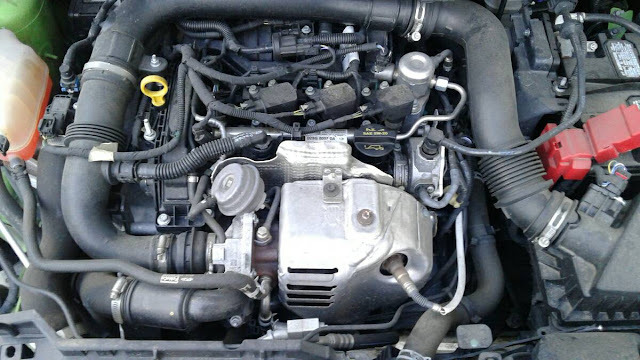 The seller attempted a fix on the oil pan and did have the car running until said fix failed. A new oil pan was priced out at $70 so it seems odd that they would even attempt to patch the original one at all. The car comes with a NYS 907A salvage paperwork in the sellers name. Someone resourceful could very easily recoup the asking price by selling good parts off the car. The million dollar question would then be: what donor car to install the drivetrain into? My vote would be something a late 80's Fiesta hatchback to keep things in the Ford family. 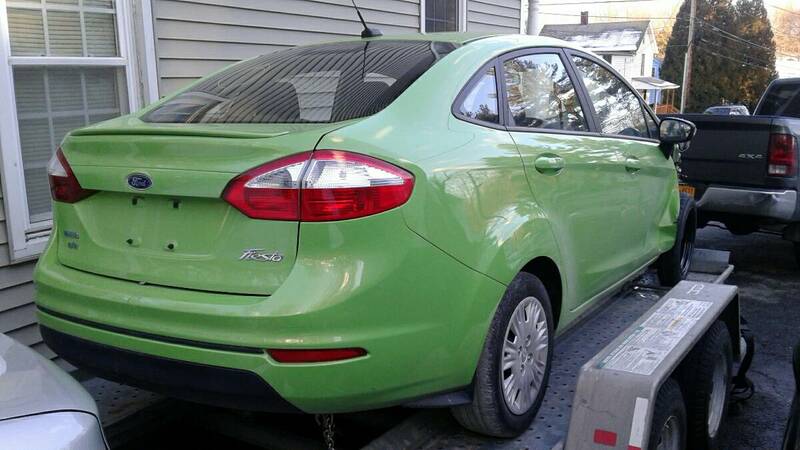 What car is deserving of a three cylinder 1.0 ecoboost engine swap? Let us know your vote in the comments. Cory is making some progress on his 1995 Mercedes C36 AMG project car. There is a Geo Metro down the road from my office with a For Sale sign in the window. Now I'm wondering how it would do with more than double the stock horsepower. 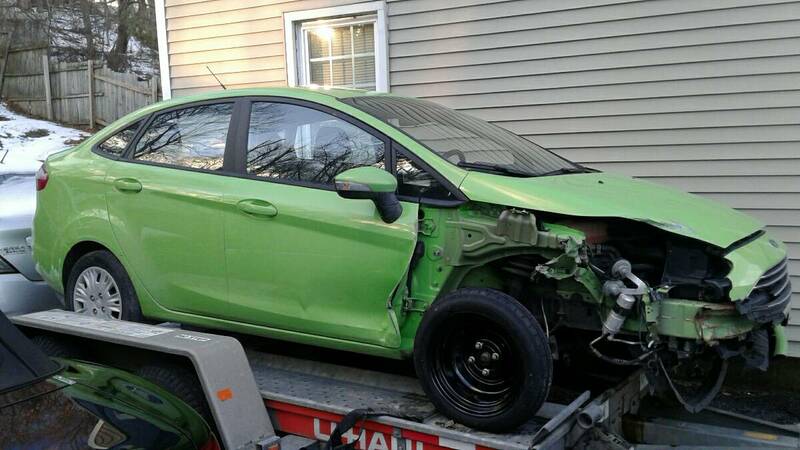 Buy a second Fiesta ecoboost, cut out rear floorpan, install second engine. Engineer some crazy double clutch and double shift linkage and everybody will be jealous of your twin engine Ford. Folks, the answer is always Volvo. That's kind of keeping it in the family, right? Divorced but still… I'm thinking ratty, LeMons-grade 1800 that no one will miss. Keep the boost pressures reasonable and the fluids cool and I bet you can get 3 hour stints out of her. I bet this would be entertaining in a spridget. Or perhaps a mercury capri if you wanted a less desirable convertible. Well I see what looks like a dipstick in the second picture so is there an engine under there somewhere? I was thinking a Spidget, too. I just can't find an engine in that mess, it looks like something from Aliens got on top of a motor. Put the mill in a Mark1 Fiesta, double the horsepower of the old Fiesta and keep it in the family. I have a 2016 1.0 Ecoboost Fiesta with 40,000 trouble free miles. It touches 50 MPG on the highway and I can climb a 2000 foot mountain road in fifth gear at 70 MPH. I keep thinking how good this engine would be in a lighter car.